LONDON, England (CNN) -- Airline pilots and cabin crew across Europe are holding demonstrations Monday to protest over rules governing their flying hours which they say are putting the lives of passengers at risk. European pilots and cabin crew are calling for shorter flying times to protect passenger safety. Organized by the European Cockpit Association (ECA), and the European Transport Workers' Federation (ETF), protesters are demanding that European Union rules on flying times are brought into line with scientific evidence. The Moebus Report -- mandated by the EU in September 2008 -- recommends that an airline crew should not operate for more than 13 hours during the day and 10 hours at night. Current EU rules stipulate pilots work up to a maximum of 14 hours during the day and nearly 12 hours at night. 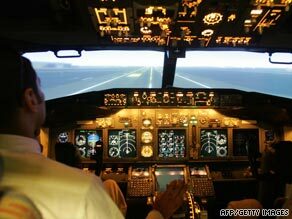 Are you concerned at the hours worked by airline pilots? Tell us. Speaking from one of the protests outside the European Parliament in Brussels, Captain Martin Chalk, President of the ECA told CNN: "At the moment, the EU level is not adequate. That's not our view that is the view of experts employed to review the EU's own level of protection." Chalk said that despite being in possession of the report, the EU completely ignored the recommendations when they produced new fatigue proposals in January 2009. The ECA and the ETF have printed over 100,000 dummy airline tickets which they will hand out to airline passengers. The tickets contain cigarette-style warnings giving details on crew fatigue and an explanation as to why the EU current legislation needs to be changed. "All we are trying to do at this stage is raise public's awareness. We're not trying to get in anyone's way," Chalk said. Hundreds of protesters are attending events taking place at 22 airports across Europe. 400 ECA members are expected to attend the protests at Madrid airport. "What we are saying today is that they need to listen to the safety review," Chalk said. "It was conducted by the best scientists in this field in Europe. It was commissioned by the European Aviation Safety Agency (EASA) and therefore it should not be ignored when writing the rules." Francois Ballestero, Political Secretary of the ETF echoed Chalk's concerns. "Flight safety is the core mission of every cabin crew member. But EU law is insufficient to ensure that air crew can perform their safety role in an alert and effective way," he said. But the EASA were critical of the protests and their timing. "This is jumping the gun. It is not a constructive contribution to a debate which is yet to happen," Daniel Hoeltgen, EASA communications director told CNN. Hoeltgen believes that the pilots are simply setting up stall for an industrial debate between the unions and the airlines. "It's got nothing to do with safety regulations. We have made it clear that we will invite the unions and the airlines to take part in a review of the current rules and the timeframe for that has been made clear." The current law in Europe on air crew fatigue is set at two different levels. There is a minimum level set by EU and then there is a level set by individual countries that can be better than that minimum level. In 2012 the EU level is due to come into force. "There needs to be a change in the law to protect passengers and our members from the insidious effects of airport fatigue," Chalk said. The ECA represents over 38,000 pilots and flight engineers in 36 European countries.